The RC30 and RC45 that preceded today's Featured Listing Honda RC51 were pure homologation specials, built in very limited quantities and designed primarily as the basis for Honda's production-based racing efforts. 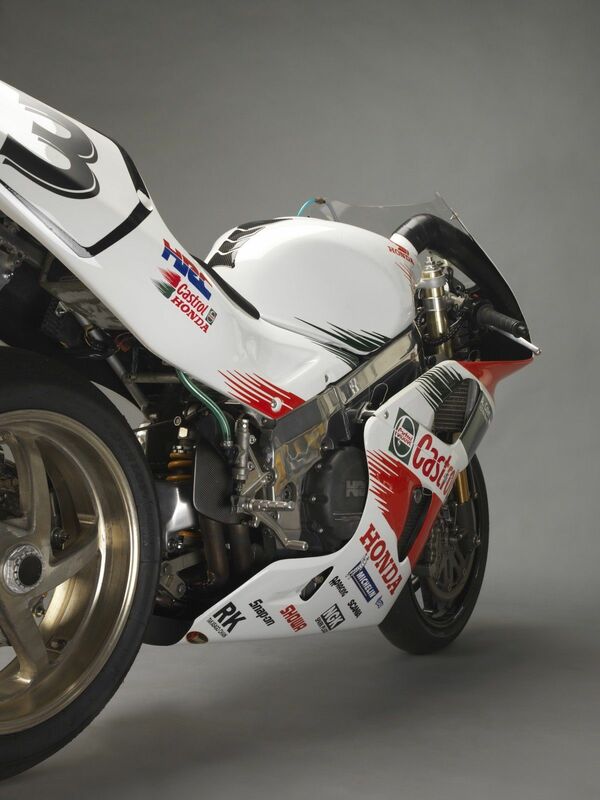 The RC51 represented a pretty big change for Honda in terms of philosophy, and was produced in much larger numbers, making it a great way for Honda fans to get a piece of their racing heritage for less money, especially on the used market. Those previous bikes embodied Honda's belief in the virtues of the V4 powerplant, but World Superbike rules gave a significant displacement advantage to v-twins that helped them dominate the series during the mid-to-late 1990s. The RC45 had its own flaws and was never as successful as the stunning RC30, but Honda felt that the rules were biased and a shift to a v-twin platform was really the only way to compete against Ducati. Basically the RC51 was Honda proving a point: that, on a level playing field, they could beat Ducati at their own v-twin game. 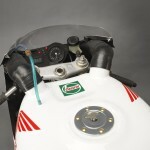 The original SP1 version of the bike that was introduced in 2000 had some teething problems: the low-rpm fueling was poor, tank range was very limited, and the bike had significant understeer, something that was addressed when the SP2 was released in 2002 with frame updates and tweaks to the front end. 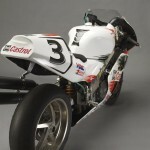 Most importantly, the bike was a winner on track right out of the gate, and took the WSB title in 2000 and again in 2002. 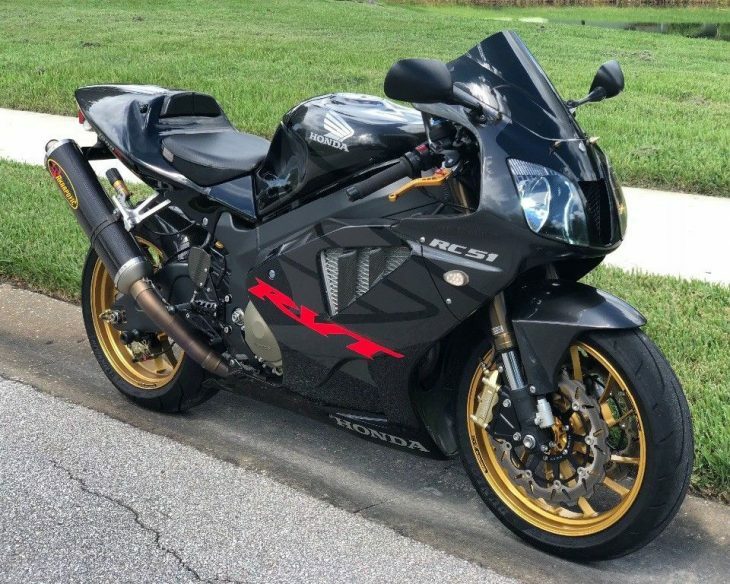 Personally, I think the RC51 is a little bit too nondescript and functional-looking in the more common silver, red, and black graphics, but the darker color scheme seen here on this SP2 looks very sleek and sinister and it should be a great bike on road or track, since it includes the updates to the handling mentioned above. You're still stuck with some snatchy low-rev throttle response, a result of the gaping throttle bodies designed for max power at high revs, and the small fuel tank, but that seems a pretty small price to pay. How small? The seller is asking $10,000 for this clean, low-mile example. 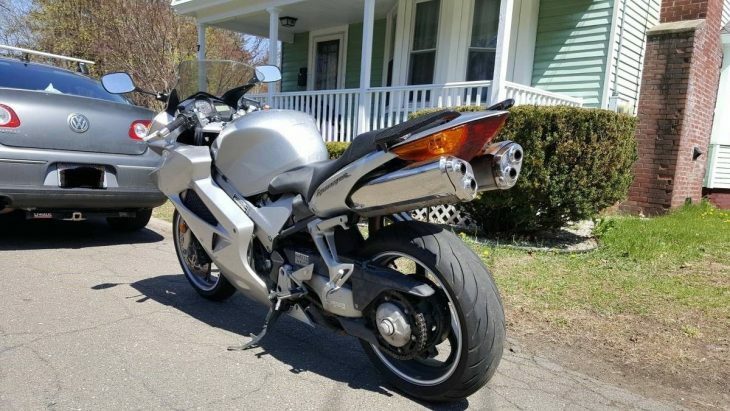 Honda's largely deserved reputation for reliability and build quality means many RC51s rack up pretty high mileage, so the 12,000 miles seen here are relatively low, and the bike comes with some tasteful extras. 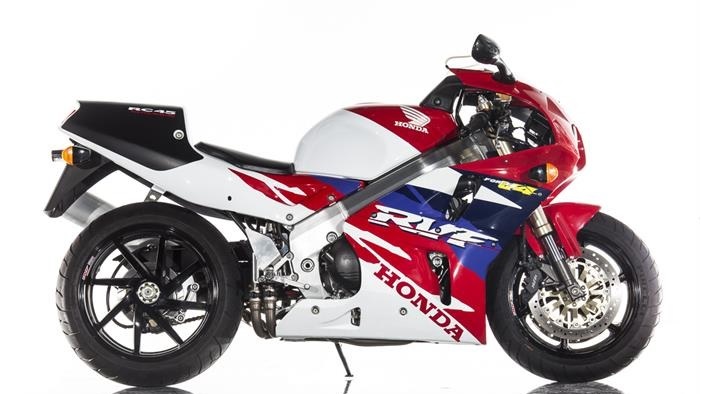 Up until recently, the RC51 has, along with the Suzuki TL-R, languished in the sportbike bargain basement: actual racing success aside, it wasn't quite the Ducati-killer Honda hoped for and that seems to have kept prices relatively low. Of course it couldn't last: the bike may only have two cylinders, but this is a genuine piece of HRC history that looks great in this darker color scheme. 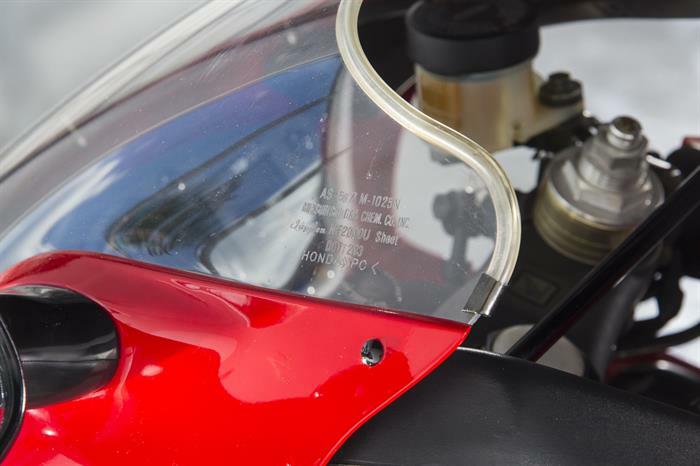 The Honda RVF750R/RC45 is always an interesting topic of discussion on RSBFS and with good reason. 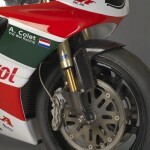 Part of Honda's technological onslaught of the 1990's (which included the RC30 and NR750), the RC45 was a true homolgation bike that came with lots of top level components including a 749cc V4 powerplant containing titanium rods and ceramic-lined cylinder walls, a new fuel injection system, and a track ready single-sided rear swingarm. Add to this a ultra light weight achieved via a new aluminium twin-spar chassis and cast magnesium components and the result was something that, on paper at least, looked ready to compete at the highest level. But despite all of this techno goodness the RC45 didn't achieve the same level of track or sales success as doesn't seem to be as prized as its predecessor, the RC30. 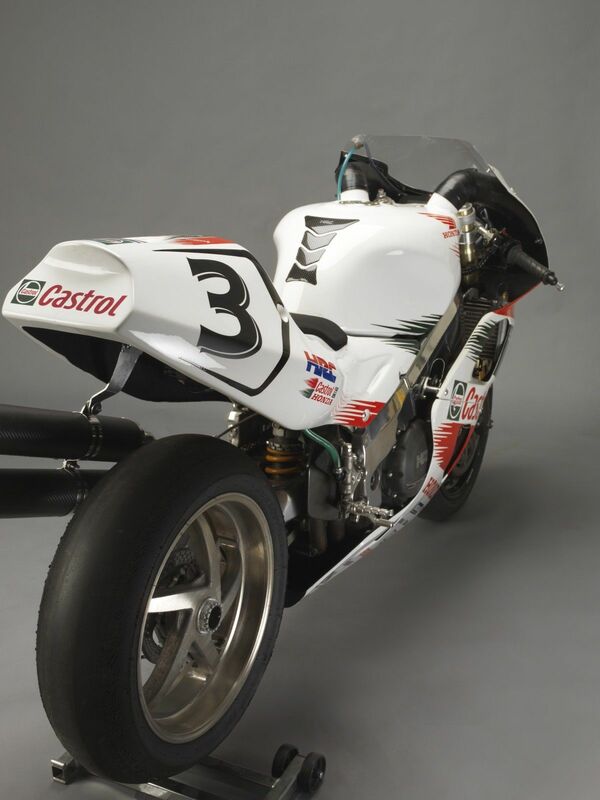 Part of this was due to the breakthrough nature of the RC30, part was due to the competition on the track being much closer and part was due to what the RC45 was like to ride on the street. The street version was tuned with a very tall 1st gear and only producing around 110/118 horses for the US/Euro version, which meant the RC45 didn't offer street riders a huge jump in performance from what other much cheaper 750 sportbikes were offering at the time. 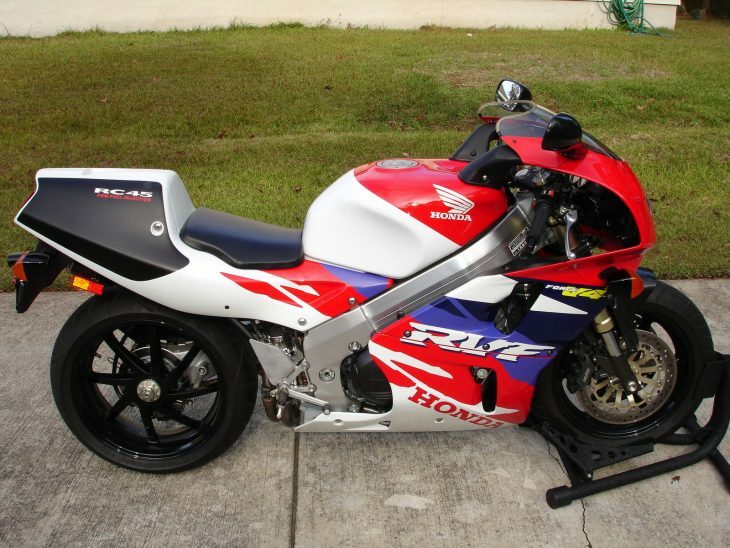 Simply put, for a lot of non-track oriented buyers the RVF750R/RC45 performance didn't match the price. Now this doesn't mean the RC45 wasn't a great sportbike- far from it. While it may have been a bit of a let down on the street, things were quite different when it was taken to the track and tuned up. In peak race form the bike was transformed to having nearly 190 bhp and was a capable enough machine to deliver championships over a span of years, including Miguel Duhamel's 1996 Daytona 200, John Kocinski's 1997 WSBK championship and Ben Bostrom's 1998 AMA Superbike Championship. 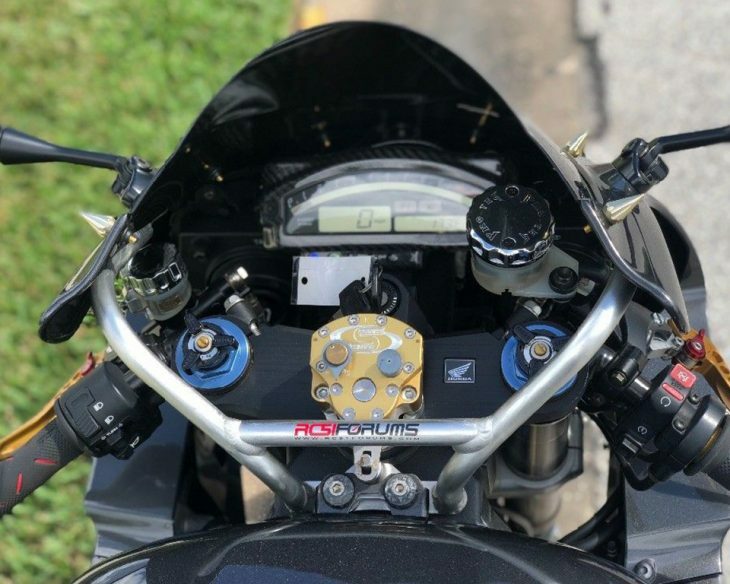 As for this particular RC45, it looks to be mostly OEM and the seller indicates that the parts which are not OEM are still with the bike. 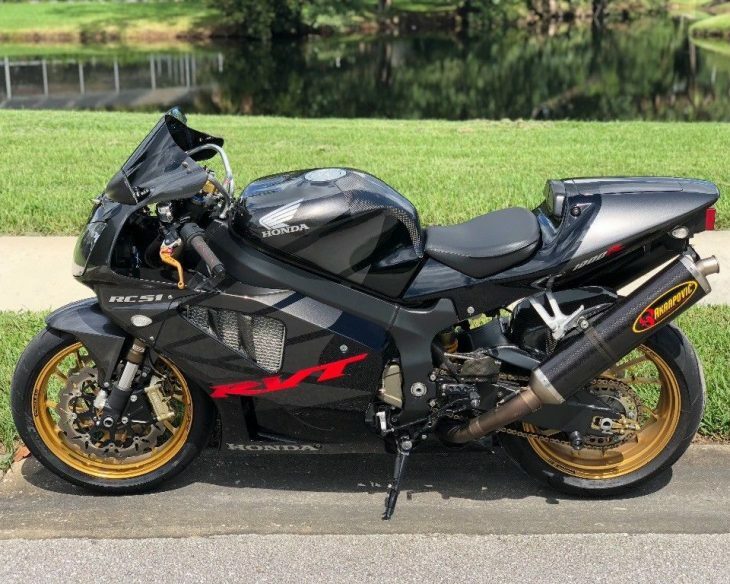 Based on the pics provided the seller seems to be a big fan of 1990's sportbikes (although not their mirrors apparently) so there is a good chance this one has been taken care of properly. 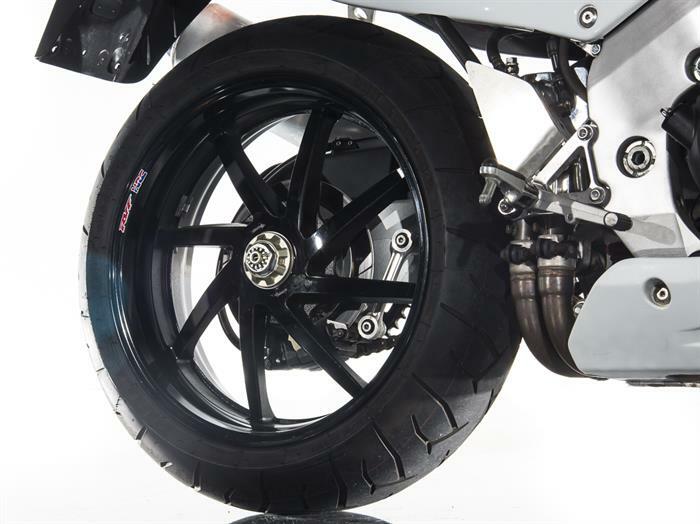 Has a (Honda CBR) F3 front wheel, HRC carbon fiber front fender, HRC rear-sets. Previous owner installed the Yoshimura bolt on muffler but have since found a brand new, in the box, stock muffler. Was going to remove the turn signals and trim the rear fender, so I bought an extra OEM rear fender to turn it back stock. Will come with all the stock parts that were removed. 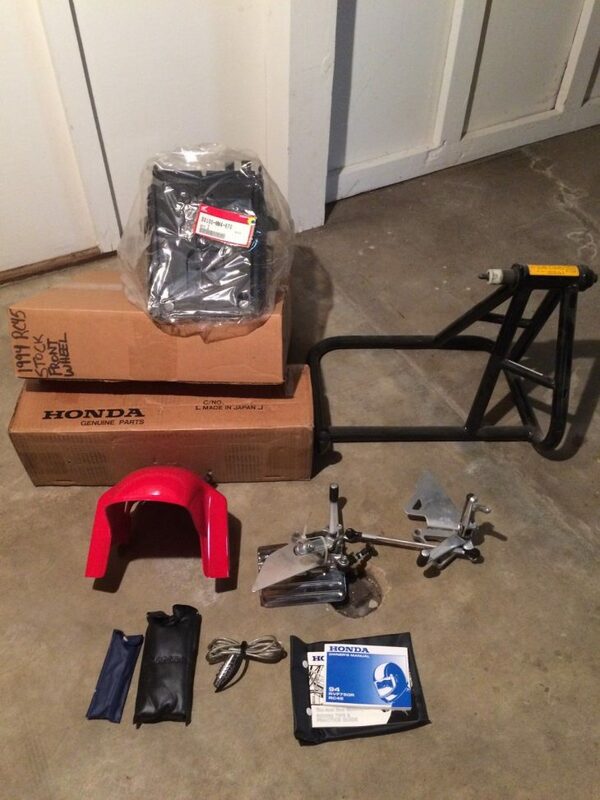 Bike still has its original tool kits, swing arm stand, and even the original helmet lock. 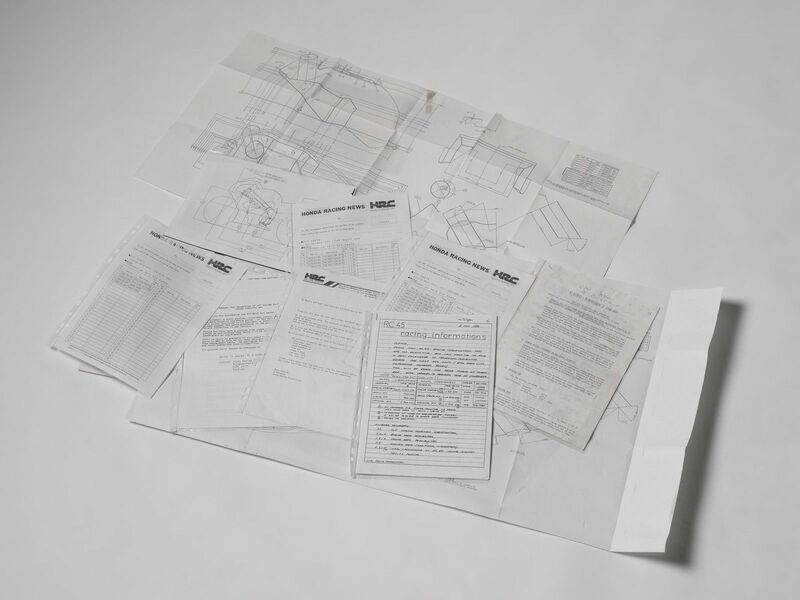 Documentation includes the service manual, parts manual, owners manual, pages from the Honda Red Book, a sales brochure, copies of the previous title and some Honda service updates. 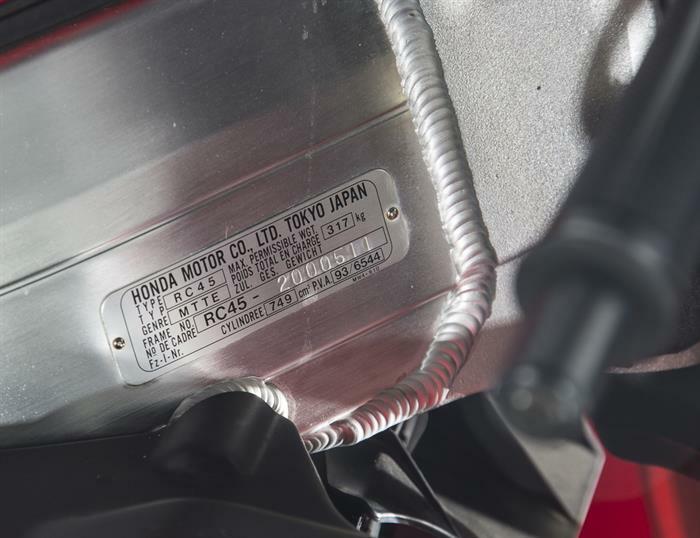 So what is this pretty much pristine bit of homologation Honda technology worth? Well current bid is up to about $30,000 USD with reserve not met. That isn't surprising given the last one of these we saw on RSBFS hit $40,000 USD. While that one was an ultra low mileage (<1000) example, I would still expect the reserve on this one to be in the mid $30,000 area if not higher. From a collector standpoint, the major appreciation in value has probably already happened. That isn't to say the value will go down, it just won't be jumping up dramatically. I think this one will probably be best suited for someone who is similar to the current owner - a fan of mid 1990's homologation bikes. 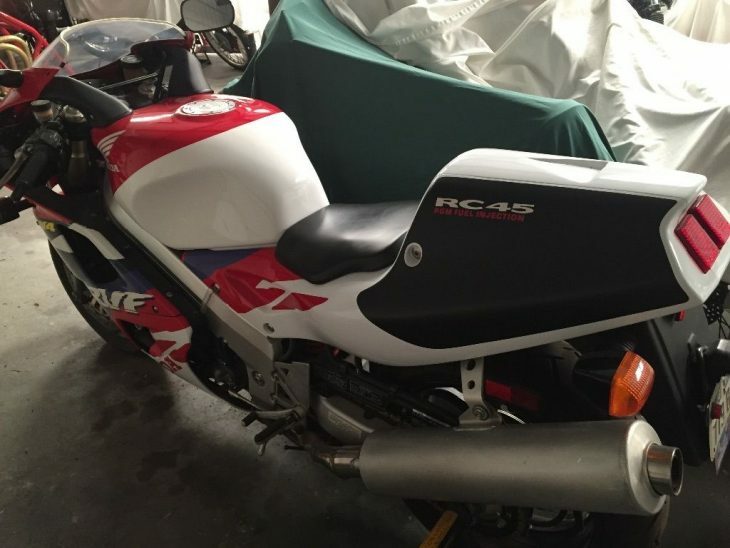 We just had a nice RC45 here on RSBFS last week and given the rarity of these it's a bit of a surprise that another one has popped up for sale so soon. While the previous bike was a gray import bike offered by a dealer in Florida, this one looks to be a US bike currently owned by a collector. 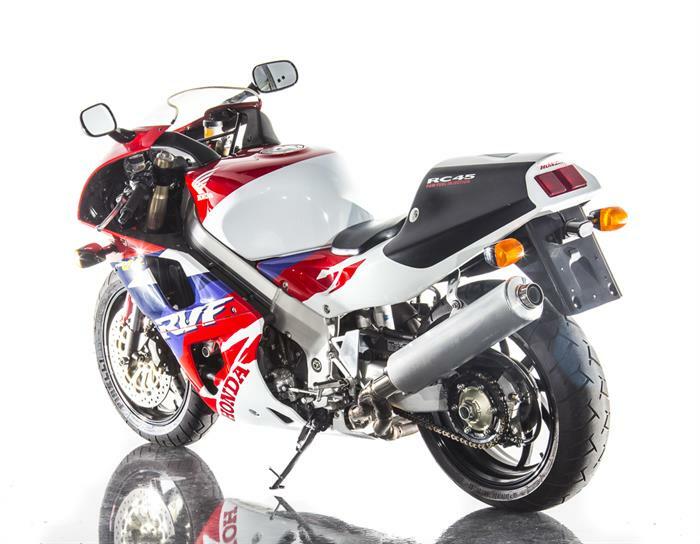 As noted in the post from last week, the RVF750R (also known as the RC45) was introduced in 1994 as the successor to the epic RC30 and was a true homologation bike. The RC45 came with a 749cc V4 engine containing titanium rods, ceramic-lined cylinder walls and gear driven cams, as well as a new fuel injection system and a race-ready single-sided rear swingarm. "Like the race version, Honda's road-going RC45 doesn't quite hit the spot, but it's still an impressive piece of exquisite engineering. 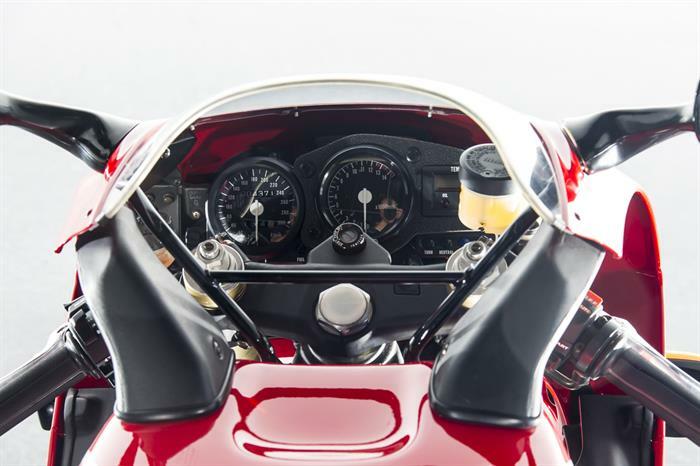 As the ultimate ‘90s Superbike, the Honda RC45 lacks the pure focus of a Yamaha R1, the visceral punch of a Ducati 916 or the exotic edginess of a Bimota SB6R. 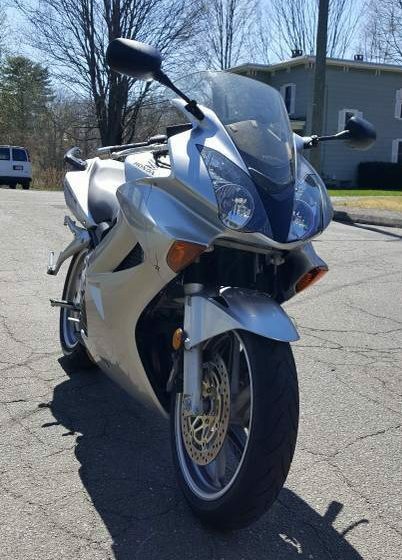 Also, people might think your Honda RC45 is a Honda RVF400 NC35 from a distance..."
Mileage on this one is a low 877 according to the seller. Unfortunately no other maintenance info is provided. 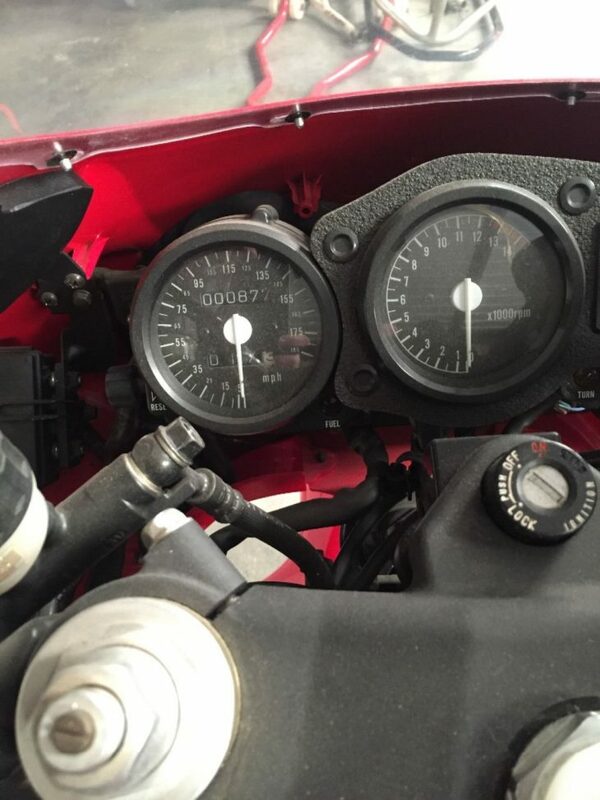 Based on the dust and color of the clutch reservoir fluid, I would bet that the bike has been standing for quite a few years and would require a thorough refresh including tires. By the pics provided the bike looks to have been part of a serious collection. Initial bid price is $40,000 USD with reserve not met. That price seems to be inline with what we have seen these go for in the past, even with the expected additional cost of a freshening. Also given the rarity of these bikes, I wouldn't expect the price to drop below the opening bid. It seems like the RC45 doesn't ring the emotional bells for a lot of collectors in the same way the RC30 did. This one is certainly in excellent condition and is probably a good investment for a serious collector, but I wish there were a few more pics and comments by the seller. 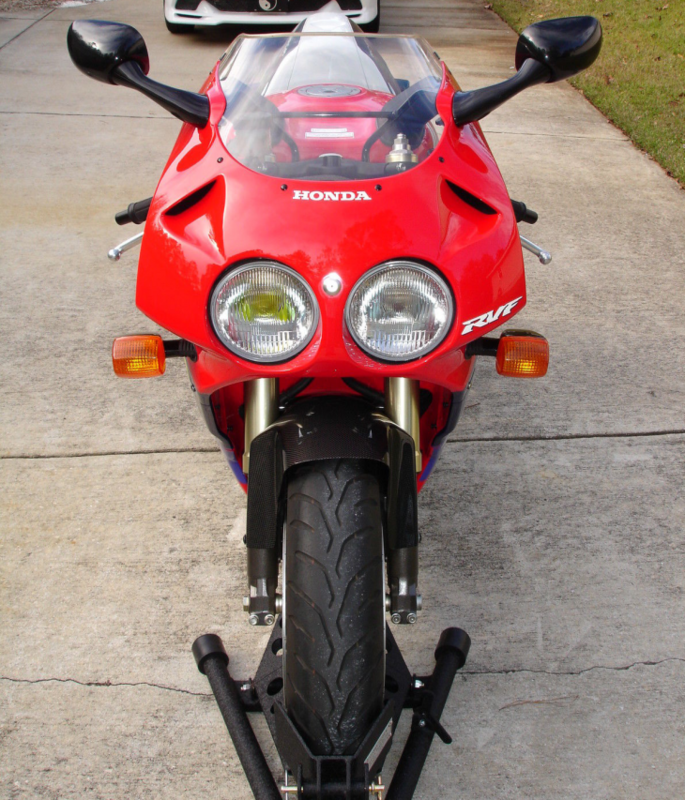 Back in the 1990's Honda introduced new technology to the sportbike world at a truly dizzying pace. From 1990 to 1999, Honda USA introduced sportbike riders to the RC30, RC45, RC51, CBR600F2, VFR750, the legendary NR750 and the CBR900RR. Personally I can't think of another manufacturer that launched so many top of class bikes over a similar length time frame. 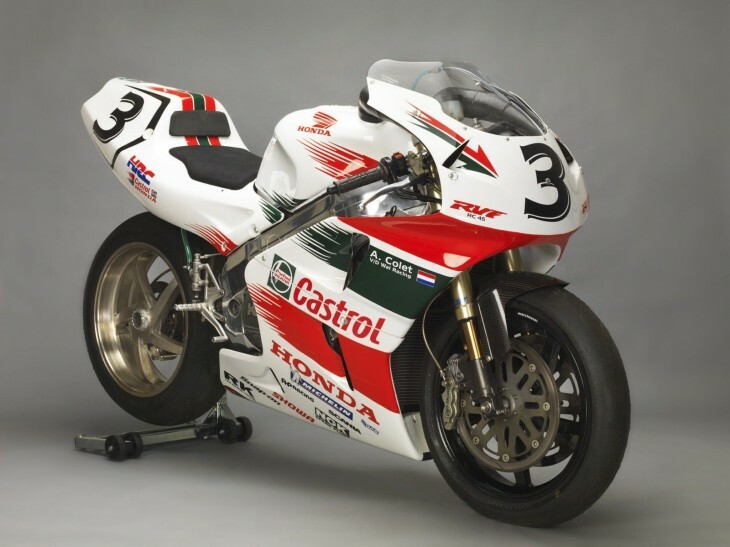 While the Honda RC30 actually launched in 1987 in Japan, it didn't come to the USA until 1990 The RC30 was a techo tour-de-force that won a lot of races and developed a deep following. The follow up RVF750R, also often referred to as just the RC45, wasn't as successful on the track but interestingly, for many collectors the RC45 is more desirable. For anyone who is interested, an overview of all the differences between the RC30 and RC45 can be found here on Wikipedia. 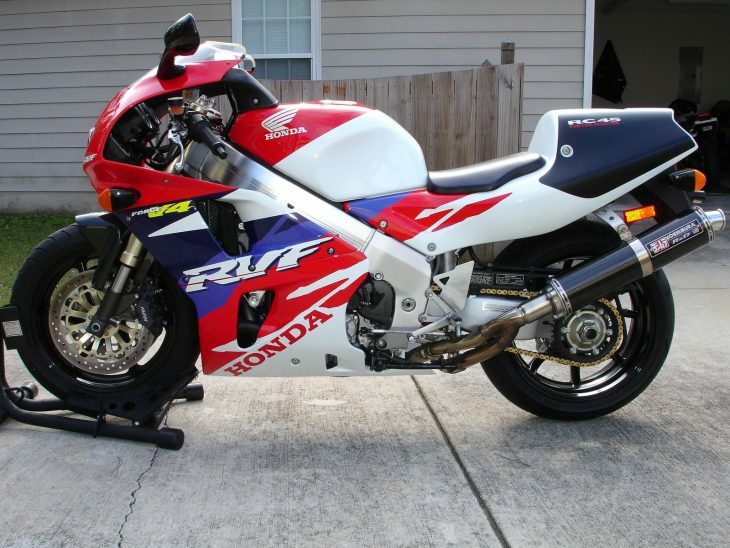 Introduced in 1994 and produced until 1999 but only imported officially into the US for 1994 with a 50 unit allocation, the Honda RC45 was a true homologation bike. Right out of the box the bike came with a lot of top shelf components including an exotic DOHC 749cc V4 engine that had titanium rods, ceramic-lined cylinder walls and gear driven cams. 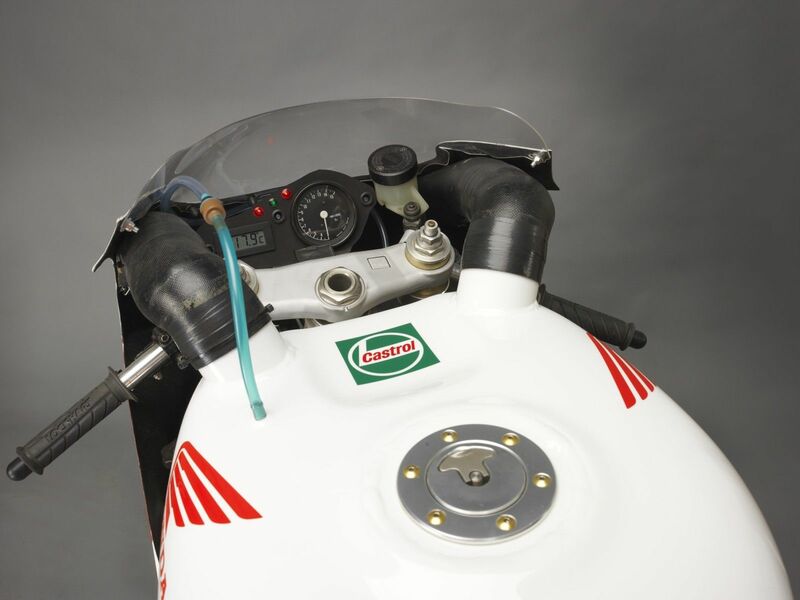 The RC45 also incorporated a new fuel injection system, lots of cast magnesium parts to reduce weight, a new aluminium twin-spar chassis and an exotic (for 1994) single-sided rear swingarm. 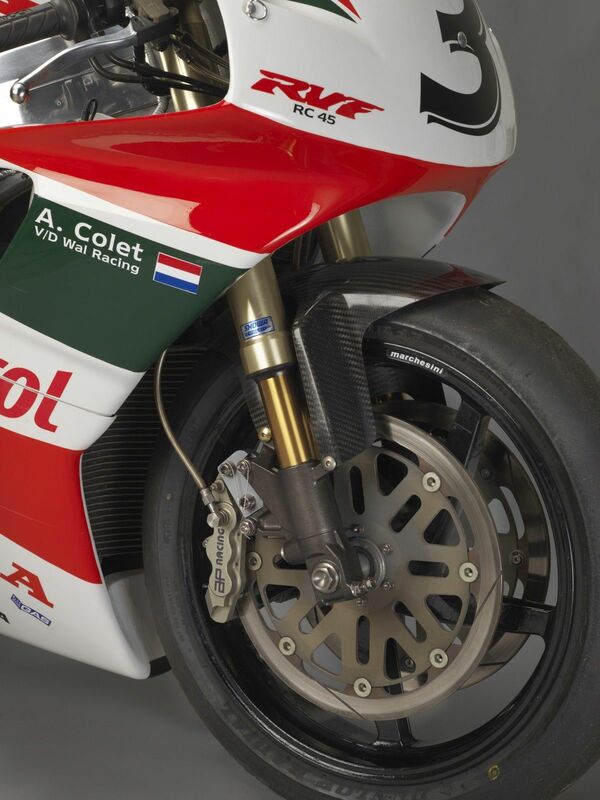 And yet despite all the new tech, the RC45 didn't have quite the same level of track or sales success as the preceeding RC30 and initially was considered to be a bit of a failure. 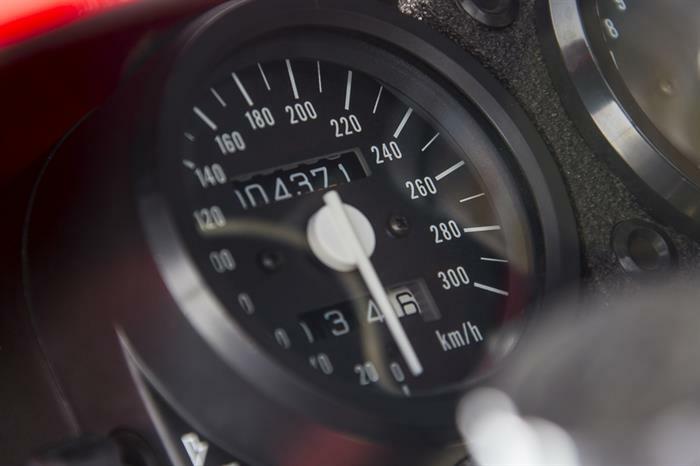 Part of this was due to the fact that the new powerplant in the street/homolgation version was tuned to only produce around 110bhp for the U.S. version/118 for the European version which wasn't a huge jump from what standard 750cc sportbikes of the same era were offering. Also street riding on the RC45 first gear was reported to be kind of a pain due to a very tall 1st gear. While the RC45 didn't find favor on the street, things were quite different when it was taken to the track. In peak race form the bike was transformed with power reported as being nearly 190 bhp. 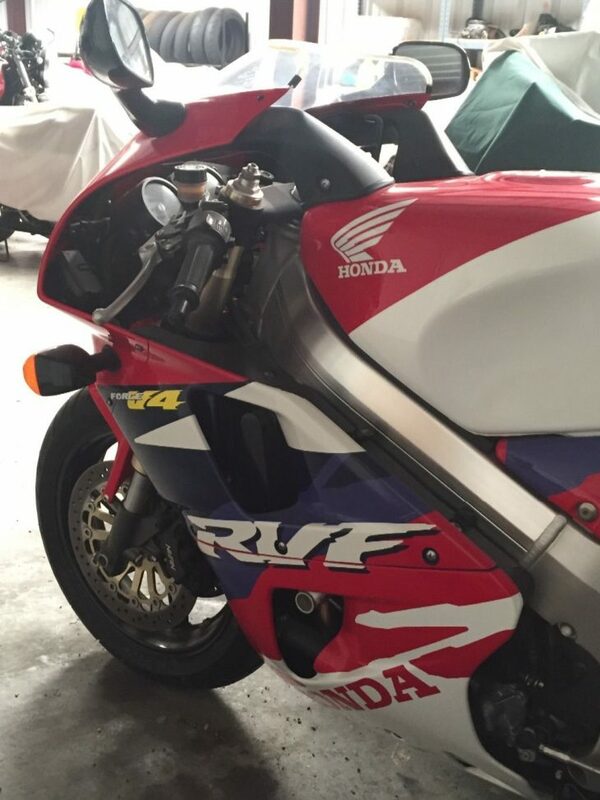 Track successes of the RVF750R included Miguel Duhamel wining the 1996 Daytona 200, John Kocinski winning the 1997 WSBK championship and Ben Bostrom winning the 1998 AMA Superbike Championship. 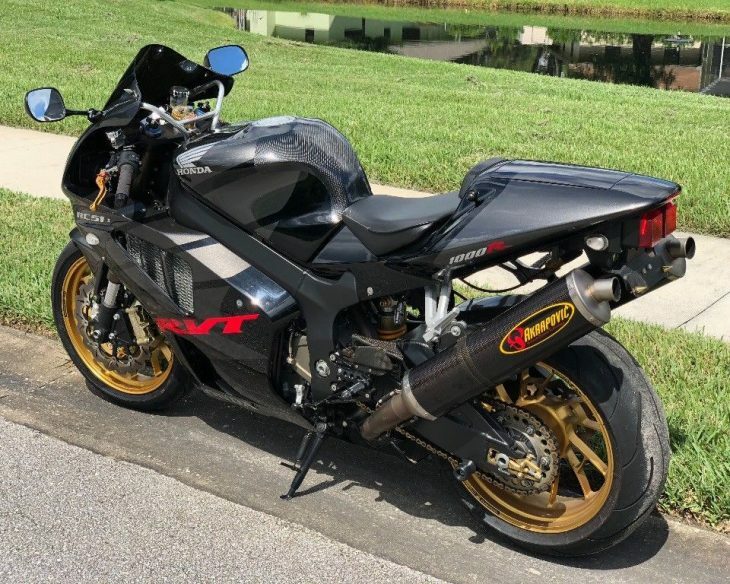 As for this particular RC45, sharp eyed viewers have probably caught that this US-located bike is listed as 1996 with a VIN # well above 50 (NOTE: This is assuming they can tear their eyes away from the art that is the perfect welds on this bike). 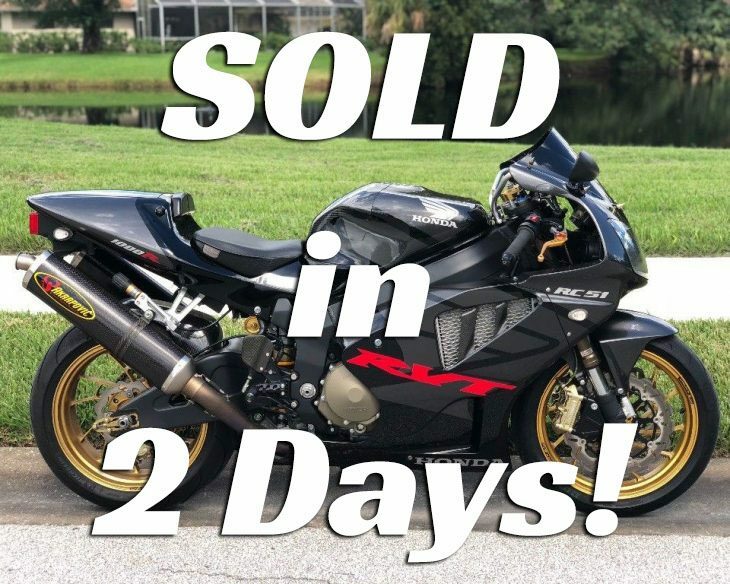 These issues are explained by the seller as being due to the fact that this particular RC45 was originally delivered/sold in Switzerland in 1996 and then imported into the USA. 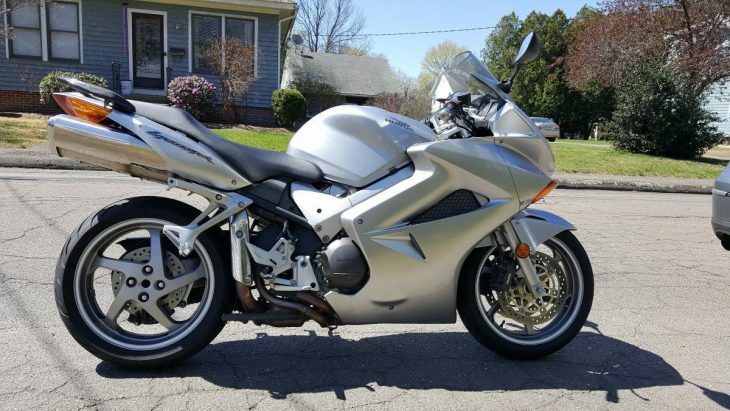 While "gray-market" RC45's can be a pain to get registered, the seller also indicates they have a US title in hand. 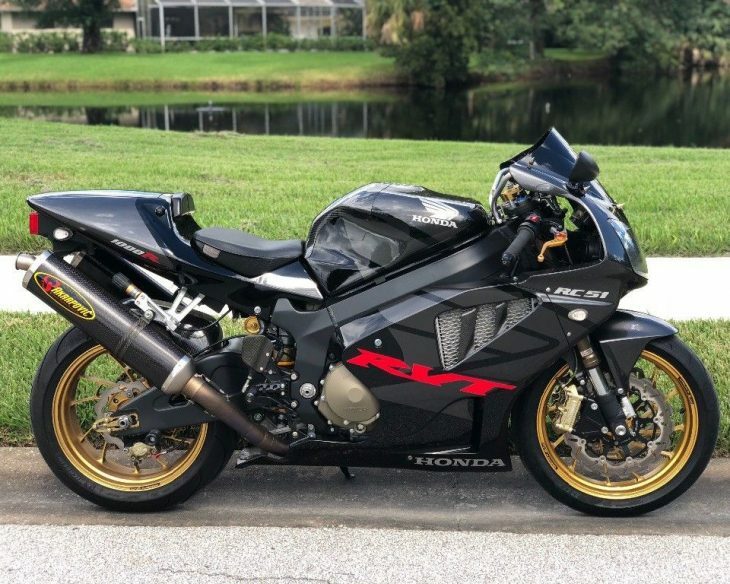 From the photos in the eBay listing, this particular RC45 looks to be completely original with only a few small nicks. I guess the excellent condition should not be surprise given the listed mileage of about 2800 miles/4400 kilometers. 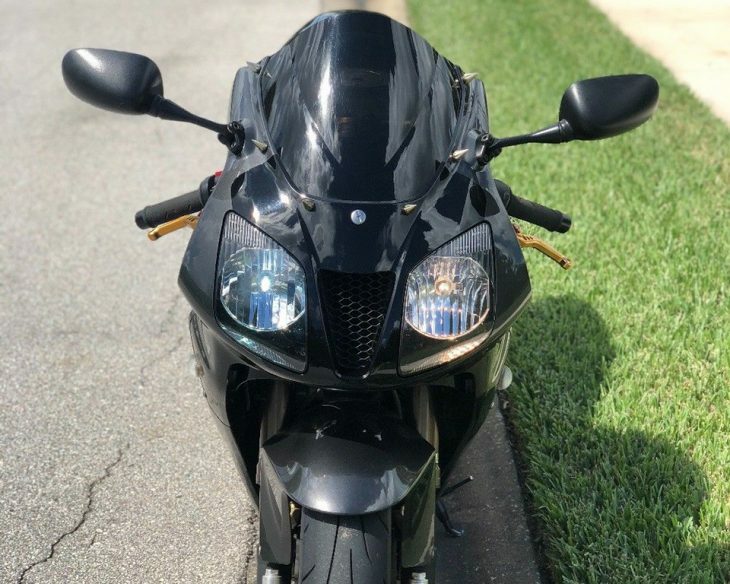 Personally my only concern is that the eBay seller has a zero feedback rating and some of the pics on this eBay listing look incredibly professional/like official promo pics instead of pics of the actual bike being sold. 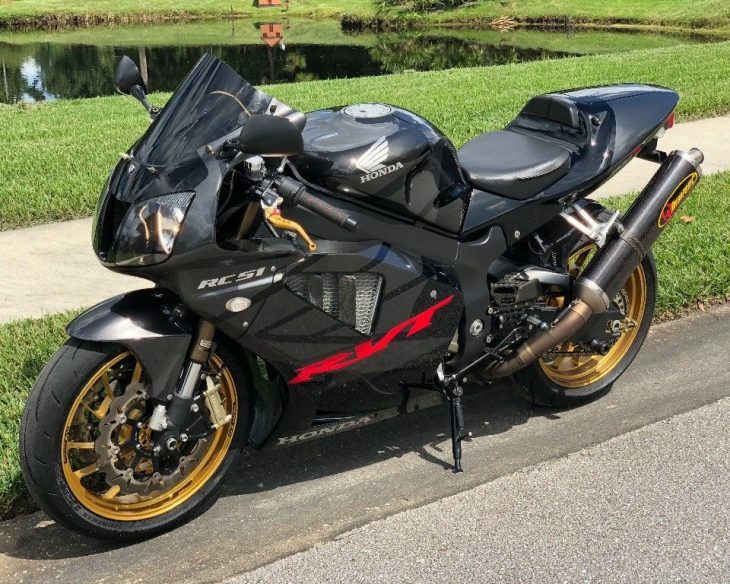 Based on the listed phone number the seller appears to be a dealer located in Florida and while the maintenance/ownership history isn't as complete as I would like for a bike like this, the seller did provide the following service info. "Recent" full service (quote marks added by me - Marty). Spare complete period Micron exhaust included. So what is this bit of mid 1990's homologation goodness worth? 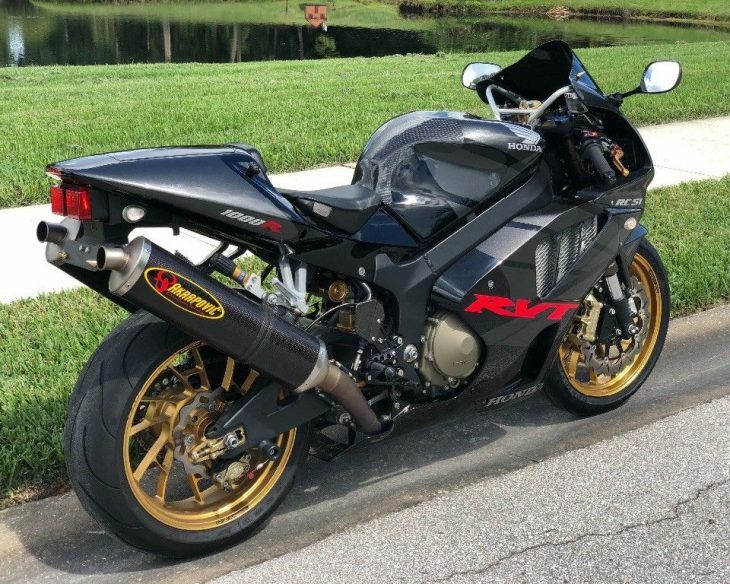 Well the RVF750R is current one of the top desired 750cc homolgation machines of the 1990's, the others being the Kawasaki ZX7RR and Yamaha OW01. 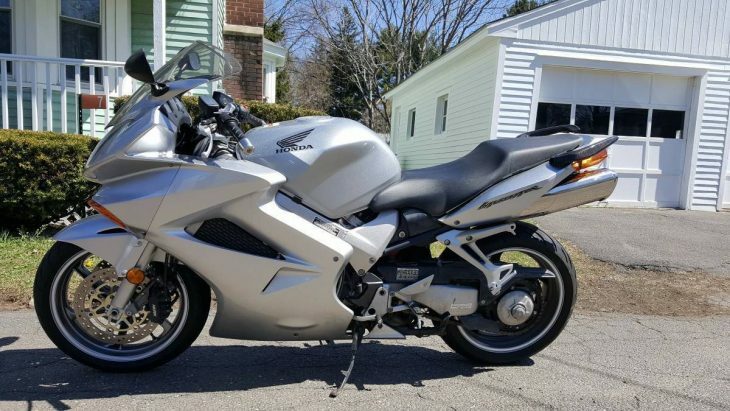 This particular RC45 looks good but there are some things I would personally follow up on, such as the VIN#/title situation and also, given the color of the brake fluid in the master cylinder, what exactly was meant by "recent" full service. 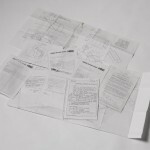 Previous postings of these seem to have gone for a price between $24,000 and $29,000 USD. Assuming the title is clear, I would expect price to be somewhere in the upper part of that range band. 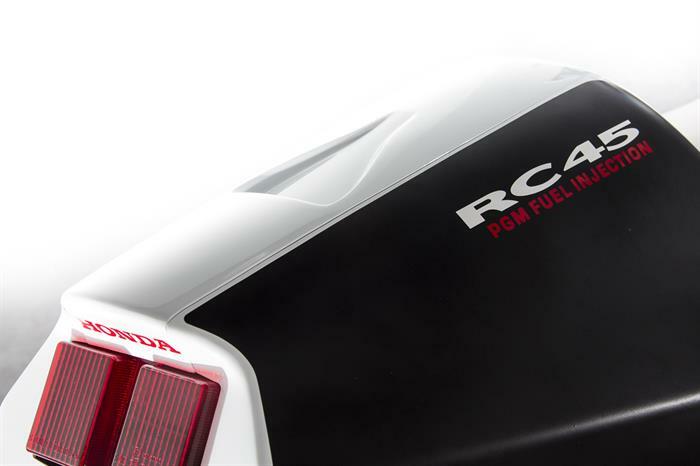 ADDENDUM: Some of our frequent readers/comments of RSBFS such as RC45 and The Collector are more experienced with the RC45, hopefully we can get them to provide their input in the comments section. 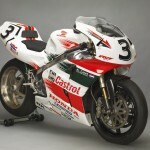 This RC45 has superbike racing history in Europe and has been treated to a restoration starting in 2009. It has since served as a display and show piece but the owner states it is fully functional as well. Thank you to all those that forwarded this link! 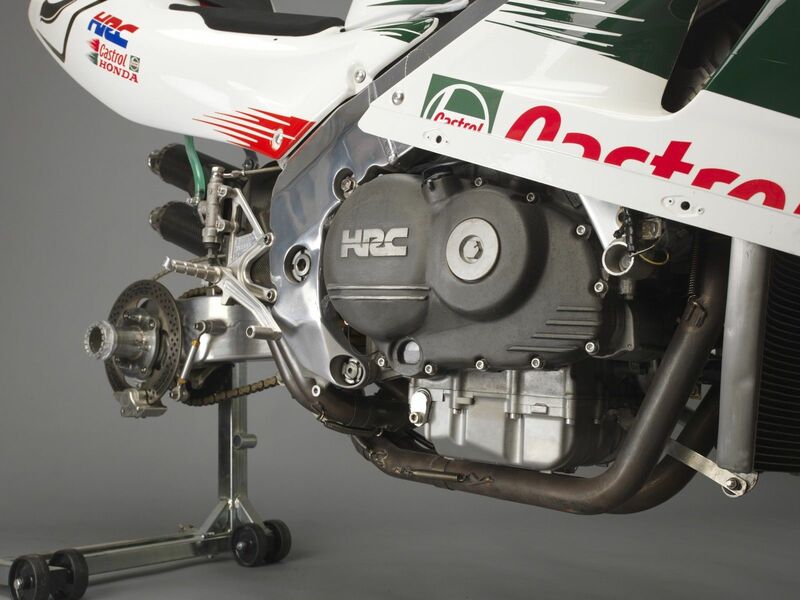 HRC kitted Honda RC45, probably one of few ex-wsbk with existing dokumentation and history from the start 1994. The bike was built by NL racingteam " V/D Wal Racing " (Johan v/d Wal) accordning to the wsbk regulations in that era with most of HRC parts. Mainly raced in the NL Superbike series and European Superbike series, also some wildcards in wsbk. After the racing era the bike was owned by an amerikan collector, lived in NL. I have owned it since 2009 and made a careful renovation / restauration, then used for showrooms and motorshows. This RC45 breathe that racing era !